The so-called Red River War raged across North Texas, and the Indian Territory during 1874-75, when the Comanche, Kiowa, and Southern Cheyenne tried to drive out hordes of White commercial buffalo hunters who had invaded their homeland in violation of treaties, and were destroying the livelihood of the Southern Plains tribes. U.S. Army units sent to protect the invading hunters fought a series of battles, small and large, eventually trapping the tribes at their winter encampments in Palo Duro Canyon in the Texas Panhandle, destroying several villages, and most of their winter supplies of food. This forced the starving survivors to walk to Fort Sill, I.T., and surrender. Fearing a quick renewal of hostilities, the Army adopted a strategy of taking hostages to guarantee the "good behavior" of the tribes. In the spring of 1875, seventy-one Southern Plains Indian men in manacles and chains, two women and one child were transported from Indian Territory, more than a thousand miles east, to a three-year imprisonment at Fort Marion, in the Atlantic coastal town of St. Augustine, Florida. The long journey was made by wagon, steamboat and train. At every stop along the route, crowds would gather to see and taunt the "Indian murderers. "Among these prisoners were twenty-seven Kiowa men (Pratt, 1964: 105). One of the youngest, only nineteen, was named Hunting Boy (Etahdleuh Doanmoe). He had been arrested on February 18th, charged with accompanying a war party led by the Head Chief, Lone Wolf (Pratt, 1964: 141). Exterior view of Fort Marion, the oldest-surviving Spanish structure in North America, ca. 1875. R.H. Pratt Papers, Beinecke Library, Yale University: See image here. Aerial view of Fort Marion. Wikipedia. See image here. In this detail of a group photo of the Kiowa prisoners, soon after arrival at the Fort Marion prison in May, 1875, Lone Wolf (Guipago) is in the upper row, far right; and Etahdleuh is the young man seated in front, far left: See image here. "The severe circumstances of their imprisonment and their being taken so far away from their homes made these Indians almost lose hope. 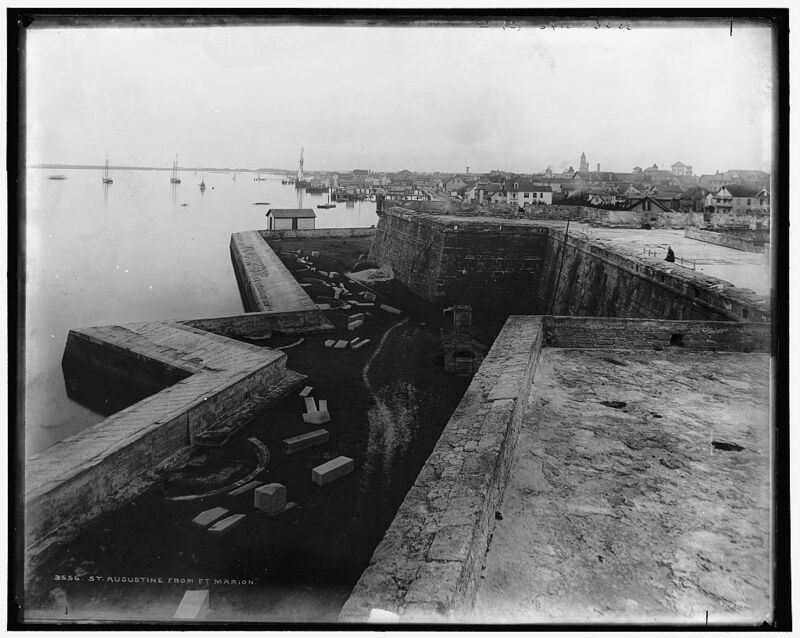 And that, added to the change from their free western life and its fine, dry air, to the close confinement within the casemates and high-walled area of the old Spanish fort in the humidity and heat of that southern climate, affected their health so that a number of them sickened and died within a few months" (Pratt, 1964: 97). Kiowa Elder chiefs, soon after arrival at Fort Marion, ca. June, 1875, a photo included with this lot; from left: Capt. Richard H. Pratt, 10th U.S. Infantry; Lone Wolf (Gui-pago), Head Chief; Walks On the Sky (Mamante), visionary & war leader; White Horse (Tsen-t'ainte) Head Warrior, a Ka-i'tsenko sash wearer; Woman's Heart (Manyi-ten); Double Vision, or "Blurry" (So-gua-se); George Fox, interpreter. Mamante died a few weeks later, July 29, 1875: See image here. Shortly after arrival in Florida, while casting about for productive ways that his prisoners might fill their time, Capt. Richard H. Pratt who was in command at Fort Marion discovered that many of the men were avid artists long used to recording experiences of their lives in drawings done on the pages of account ledgers, an extension of traditional paintings done on buffalo robes. Scrambling among the businesses of St. Augustine, and later through the assistance of supporters throughout the eastern United States who contributed money and materials, Pratt was able to locate sufficient sources of paper, pencils, ink, crayons and watercolors to keep many of his charges occupied. Capt. Richard Henry Pratt, 10th U.S. Cavalry, ca. 1885. Dickinson College Archives, Carlisle, PA: See image here. St. Augustine had long been a tourist town, where wealthy Americans from New England and the Midwest could escape the northern winters. On weekends, civilians were allowed to visit the prison. Very quickly it developed that not only were many of these men accomplished artists, but many of the visitors admired their work and were willing to pay good money for it. General of the Army William Tecumseh Sherman offered five dollars, then a handsome sum, for one book of drawings. Pratt saw a source of income and hope for men who had little of either. He presented collections of Indian drawings to prominent visitors who thereafter became supporters and contributors to his program of rehabilitation for men who had been indicted---many felt unfairly so---as war criminals. One of these wealthy supporters was Sophia Negley, a pillar of the Presbyterian community at Pittsburgh, PA. During a visit the following year, she acquired a collection of 33 stunning compositions, inscribed: "Book of Drawings by Etah dle uh Kiowa prisoner Fort Marion St. Augustine, Fla. Aug. 1876." The date is significant. Front-page news across the United States the previous month, while the 20-year-old Kiowa artist was creating this record, reported the "Custer Massacre" in far-off Montana Territory. The Kiowa pronunciation of Etahdleuh Doanmoe is E-talyi-Donmo (Mooney, 1898: 401). This translates as "Boy Hunting." In the literature he is usually called "Hunting Boy." His drawings of early hunting prowess suggest that the sense of his name might have been "That boy is a hunter." However, early glosses interpret it more as "Hunting for Boys," or "Going Out Searching for Boys." The Kiowa were famous (or INfamous, to their victims) as raiders, who routinely kidnapped children in "Mexico" (anywhere from New Mexico, to central Texas, and south into Chihuahua, Coahuilla, Durango & Zacatecas), bringing them back to Indian Territory, raising and enculturating them as Kiowa. Half or more of the tribe had Mexican blood by the late-19th century. It is likely he was named for a famous raider of the previous generation who had specialized in kidnapping male children: "Always Hunting for Boys." Other drawings by Etahdleuh grace the collections of the National Anthropological Archives, the Beinecke Library, Yale University, and elsewhere, but this book collected in 1876 is his earliest-known work, hidden from all but the Negley family for the past 142 years. Compositions include many hunting scenes, for buffalo, elk, white-tailed deer, turkeys and golden eagles; his honorable service as a scout locating buffalo to feed his people, and as a scout for war parties; or parading in his "best dress" to show off for the girls. A two-page, large-scale battle scene against a Sauk-Fox hunting party must depict a deed by Etahdleuh's father, since the famous battle occurred in 1854, two years before the artist was born. His landscapes are filled with tree-lined streams and intervening hills. A bird's-eye view of Fort Sill, Indian Territory, with surrounding streams and nearby Medicine Bluff, documents the spot from which he was launched, in chains, into a different world. Four drawings show the prisoners' life at Fort Marion. "...quartermaster sergeant in charge of the government property connected with the prison. It was his duty to take care of all the stores for which I was responsible to the government, to keep memorandum of issues of food and clothing, and to know that tools were properly restored to their place after being used and that nothing was left lying around promiscuously. He also drew these stores from the army commissary [located elsewhere in St. Augustine] and issued to the cooks the food supplies in proper quantity daily, keeping record of the same. He and the first sergeant of the Indian company [the Cheyenne, Making Medicine] were also intermediaries next to me in command and particularly responsible when I was absent from the fort. They had freedom to come to my house [outside the fort] with messages. I had had much to do with white, colored and Indian soldiers, and among all these experiences there are none that showed finer manhood and fidelity to duty than these two Indians, and there were others like them among their fellow prisoners. Their interest and concern in the righteous working out of what I was trying to do was constantly in evidence in their actions" (Pratt, 1964:185). Prisoners at Fort Marion, 1877. Etahdleuh is seated front, 2nd from right; Making Medicine sits beside him, 3rd from right; Etahdleuh's mentor and war-partner, Koba (Wild Horse) sits 4th from right: See image here. After three years, when it had become clear that war on the Southern Plains was over, most of the prisoners were allowed to return to Indian Territory. Sixteen of the younger men, including Etahdleuh, volunteered to remain in the East. He spent the next year attending the Hampton Industrial Institute in Virginia, polishing his knowledge of English. During the same period, Capt. Pratt was arranging permissions from the War Department, and the Indian Affairs commissioner, to found a school for Indian children, where he could expand the teaching methods he had developed at Fort Marion. During the summer of 1879, Etahdleuh traveled on Capt. Pratt's behalf back to the Kiowa & Comanche Reservation in Indian Territory, to recruit 26 Kiowa and Comanche children as students for the new Indian Industrial School opening at Carlisle, PA. By the time Capt. Pratt welcomed him and the students early in the autumn, Etahdleuh had traveled further than any other Kiowa who had ever lived. He had done so completely alone, speaking a foreign language, purchasing tickets on stage coaches and trains, negotiating large cities and finding food and lodging each night for himself and his young charges. For a 23-year-old man who four years earlier had known nothing more of the world than the buffalo plains, his accomplishment was on an epic scale illuminating his courage, character and high intelligence. During his years at the Carlisle Indian School, Etahdleuh remained a leading spirit, and the counselor and refuge of the other Kiowa and Comanche students. 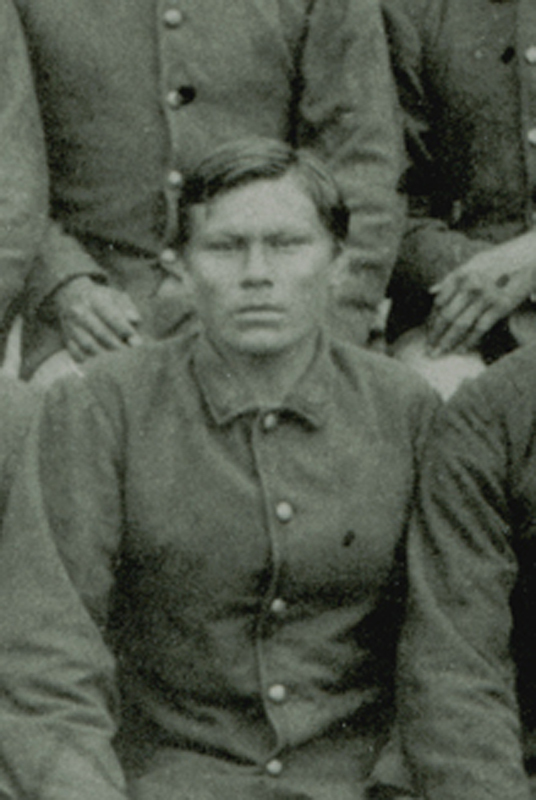 Etahdleuh seated center, Senior Cadet at Carlisle Indian School, ca. 1882. Dickinson College Archives, Carlisle, PA. See image here. In 1882, Etahdleuh married another Kiowa student at the Carlisle Indian School, Laura Tone-adle-mah (Broken Leg), sister of the last Kiowa Head Chief Ah-peah-tone (Wooden Lance). This illustrates the high regard in which he was held by fellow tribesmen. Only the most-respected might marry the sister of a Head Chief. The couple returned to Anadarko, as teachers later the same year. Two sons were born to them. Laura Doanmoe (later, Laura Pedrick), Wife of Etahdleuh. Photos, in traditional Kiowa, and "White" dress, by David Rodocker, Winfield, Kansas, ca. 1883-84. See image here. Richard Doanmoe, son of Etahdleuh & Laura, by J.N. Choate, Carlisle, PA, ca. 1886. Dickinson College Archives & Special Collections, Carlisle, PA: See image here. The Presbyterian congregation at Carlisle had long supported and encouraged Etahdleuh and Laura. In gratitude, the couple returned to Carlisle in 1886, where Etahdleuh studied for and was ordained as the first American Indian minister of that faith. In the autumn of 1887, the couple returned again to Indian Territory. Etahdleuh wrote to Pratt in February, 1888: "I will do all I can for the good of my people." What he did not communicate was that like his brother-friend Koba, he was wasting away from tuberculosis. Three months later, the school's newspaper reported: "Sadness came to the hearts of all our students and employees who gathered in the chapel Saturday evening, and an impressive silence spread over the whole company when the news was given by Capt. Pratt that Etahdleuh Doanmoe was dead. A braver, more simple, more true, more faithful Indian did not live" (Indian Helper, May 4, 1888). In these brilliant, early depictions of his life before 1875, re-discovered after the passage of nearly a century and a half, Etahdleuh Doanmoe, Hunting Boy of the Kiowa, lives again. Etahdleuh's mother was a native Mexican girl, kidnapped as a child and raised among the Kiowa. That is about ALL that has been known of his family, and it has routinely been misinterpreted by recent ledger art commentators to suggest that Etahdleuh was bi-cultural. He wasn't. All he knew was Kiowa culture. All he tried to do during his life was help his Kiowa people. Etahdleuh's father obviously was Kiowa, but was deceased prior to 1879, so out of traditional respect, none of the Kiowa would speak about him. The earliest surviving tribal census wasn't until 1895, so there is literally NO direct information about his family, or his life before 1875, when he was dragged off in manacles and chains to Fort Marion. Hence, our astonishment at the "window" into that vacuum provided by this miraculous collection of biographical drawings showing his life as a young, Kiowa man; and some of the earlier events which suggest the importance and tribal standing of his father. Sitting in the Saddle (Tau-an-kia), by Will Soule, at Camp Supply, Indian Territory, ca. 1867. National Museum of Natural History, Neg. No. 01625603. "The Indians Fighting Against the Army," by Etahdleuh, 1880. National Museum of Natural History, Cat. No. 08517900. See image here. One of the surprising facts about Etahdleuh's later life is that in 1882, while at Carlisle Indian School, he got married to another Kiowa student named Laura Tone-adle-mah (Broken Leg), who was not "just any girl." She was the daughter of Lone Wolf's brother Red Otter (Apen-guadal), another prominent chief. Laura was also the only sister of Red Otter's son Ah-peah-tone (Wooden Lance), last Head Chief of the Kiowa tribe. Ah-peah-tone, (also Apiatan---Wooden Lance), by John K. Hillers, Washington, D.C., 1894. National Museum of Natural History, Neg. No. 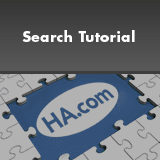 gn_01392a: See image here. Etahdleuh's marriage DENOTES both, that Etahdleuh was also Onde---he couldn't have married Laura otherwise; and that the family of Lone Wolf held the young man in very high regard. In turn, this suggests that he may have been materially involved in recovering the bodies of Sitting in the Saddle, and his cousin and war-partner Gui-tan, son of Red Otter, who were killed at the same time in Texas in 1873. The purpose of the war party for which Etahdleuh was later arrested, was to recover the bodies of those two men for proper burial. This might partly explain the gratitude shown by Red Otter, in allowing his daughter to marry Etahdleuh. Gui-tan, son of Red Otter and older brother of Laura Tone-adle-mah. Photo by Will Soule, at Camp Supply, Indian Territory, ca. 1867. National Anthropological Archives, Neg. No. 40985. See image here. The syllables Gui-tan translate as "Wolf, Little," probably meaning "Coyote" (see Mooney, 1898: 404 & 424). Unaccountably, this well-documented portrait has recently been re-cataloged as "unidentified" at the NAA. Had he not been killed in 1873, Little Wolf would have been Etahdleuh's brother-in-law. The marriage of Etahdleuh to a sister of the Kiowa Head Chief also DENOTES that Etahdleuh's father was Onde. Heretofore, the only "fact" known about Etahdleuh's father, recorded on the enrollment card at Carlisle School for Etahdleuh's 12-year-old sister Little One, called "Mabel Doanmoe," was that he had died before 1879: See image here. The further notation "tsa-kay-hys" is not a name, but likely is a close transliteration of the Comanche expression Tsa-ke-haits---"A good friend who is no more" ---the traditional, courteous reply when some official at the school asked about the deceased father's name. [Our thanks to Carl Jennings, for this reading]. That Etahdleuh's father must have been of considerable importance is illustrated by the reception the young man received when he returned to Anadarko in 1879. He had been a 19-year-old teenager the last time most of the Kiowa had seen him. Yet within a couple weeks of his return, 26 of the leading Kiowa and Comanche chiefs had agreed to send their heirs a thousand miles east with him, to stay for years. This would be incomprehensible, unless Etahdleuh was himself the scion of a leading family. "Sleeping Wolf (proper name Gui-k'ati, 'Wolf Lying Down'), Second Chief of the Kiowa, a delegate to Washington in 1872, and a prominent leader in the outbreak of 1874-75. He was shot and killed in a quarrel with one of his own tribe in 1877. The name is hereditary in the tribe and has been borne by at least five successive individuals, the first of whom negotiated the permanent peace between the Kiowa and Comanche about 1790" (James Mooney, 1912: 601). Wolf Lying Down (Gui-k'ati, or Gui-k'te), aka "Sleeping Wolf," 2nd Chief of the Kiowa & Wife. Photo by Alexander M. Gardner, in Washington, D.C., 1872. National Museum of Natural History, Neg. No. gn_01387. See image here. And an enlargement here: See image here. The only thing known about Etahdleuh's mother is that she had been a native Mexican kidnapped as a child, then raised and enculturated as a Kiowa. Look at the face of the wife of Wolf Lying Down. Compare the shape of her mouth and nose, with those of Etahdleuh. Etahdleuh Doanmoe, in Washington, D.C., March 22, 1880. Beinecke Library, Yale University. See image here. It is very likely Etahdleuh was so successful, and treated with such deference, not only because of his outstanding personal qualities, but because he was of the same Onde rank as Wooden Lance, and Sitting in the Saddle. Etahdleuh may have been a son of the man who had been Head Chief in the absence of Lone Wolf. The new evidence contained in these early drawings by Etahdleuh indicates that his father was one of the ten members of the Ka'itsenko Warrior Society (see commentary for Pp. 22, 24, 29-30 & 31, below). Red Otter (Apen-guadal), who became Etahdleuh's father-in-law in 1882, was also a Ka'itsenko member (see Meadows, 2010: 403). A ca. 1880, Kiowa drawing now in the Cincinnati Art Museum depicts Red Otter wearing his red Ka'itsenko sash in a battle with Navajos: See image here. The marriage of Etahdleuh and Laura Tone-adle-mah, daughter of Red Otter, was therefore the union of two children of the leading warrior families of the Kiowa tribe. From the 1872 portrait, we can see that Wolf Lying Down had lost the sight in his right eye, probably a battle injury. The family legacy was among the most significant in Kiowa history. When the tribe had migrated south from the Black Hills area in the 1770s, following the lure of wild horse herds on the Southern Plains, it had been the first Wolf Lying Down who in ca. 1790 negotiated an end to long warfare with the Comanche, into whose territory the Kiowa had immigrated. A grandson bearing the same name was killed in battle by the Cheyenne in the summer of 1838. And a son of that man was killed by Mexicans while returning from a horse raid into Chihuahua, in 1858. His death was considered so important a loss it marks that season on the Kiowa calendar (Mooney, 1898: 162-4, 192, 273 & 306): See image here. The Wolf Lying Down who was photographed in 1872, the probable father of Etahdleuh, was son of the man killed in 1858. The author is very grateful to Vanessa Jennings, Kiowa matriarch, and her husband Carl, who have been both patient and helpful in answering questions from this amateur in the field of Kiowa cultural history. Koos van Oostrom, independent scholar in the Netherlands, also contributed helpful information. Cover This drawing book is identical in size, and with the same printed cover as two other drawing books annotated by Capt. Pratt in mid-1876, indicating that all were acquired at about the same time, then provided to the prisoners in Pratt's care at Fort Marion. A book of drawings by Koba (Wild Horse) was presented by Capt. Pratt to Miss Josephine Russell at Fort Marion in June, 1876. Koba-Russell Drawing Book, Cover. Mandeville Library Special Collections, UC, San Diego (La Jolla). See image here. Another collection with identical cover was created by Zo-tom (Biter), and presented by Capt. Pratt as a gift to his own daughter, June 13, 1876. Beinecke Library, Yale University, Cat. No. WA MSS S-1174: See image here. "Book of Drawings by Etah dle uh Kiowa prisoner Fort Marion St. Augustine Fla. Aug. 1876." P. 1 Changing of the Indian Guard at the Draw Bridge Entrance to Fort Marion. 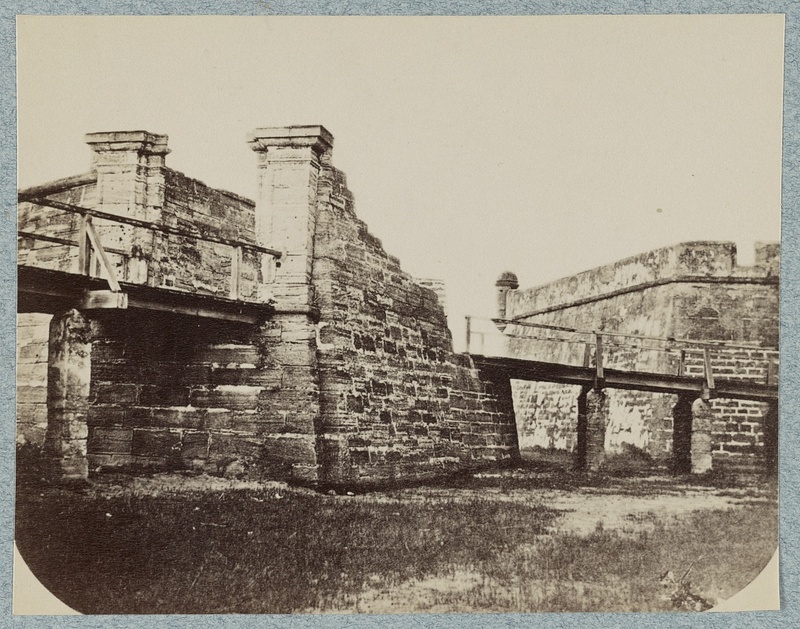 Drawbridge Entrance to Fort Marion, 1880s, by William H. Jackson. Two views. Library of Congress, Prints & Photographs Division, Neg. Nos. LC-D4-3559, & LC-DIG-ppmsca-35302. See image here. Note the diagonal walls of masonry at the left, shown with one of the prisoners sitting atop, in Etahdleuh's drawing; as well as the stone supporting pillars of the wooden drawbridge. The confrontational pose was apparently part of the exchange ceremony. P. 2 Prisoners Looking Out to Sea, from the Terreplein, or Cannon Deck, of Fort Marion. 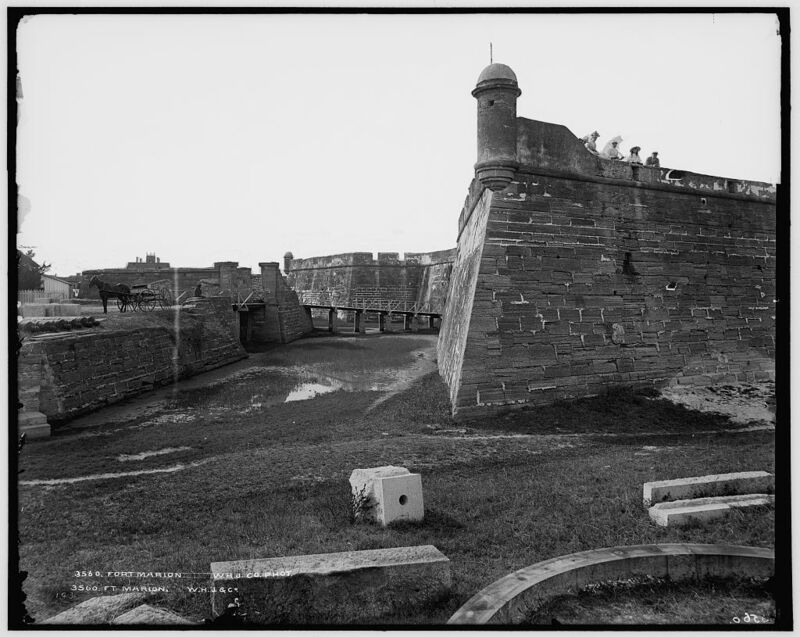 The Terreplein of Fort Marion, facing east toward the Matanzas River, 1880s, by William H. Jackson. Library of Congress, Prints & Photographs Division, Neg. No. LC-D4-3556. See image here. In the drawing, Etahdleuh shows the tall Watch Tower at the far right. Fort Marion Watch Tower. Stereograph by "The Florida Club," 1880. New York Public Library, Neg. No. G90F139_036F: See image here. P. 3 Classroom Instruction at Fort Marion. Koba-Russell Ledger, 1876. Mandeville Library Special Collections, UC, San Diego (La Jolla). See image here. In Etahdleuh's drawing, then, the uniformed officer at left, leaning on the chair, is Capt. Pratt; and the man at right, with the walking stick, is the interpreter George Fox. The guest-lecturer is unidentified. Indian students in classroom at Fort Marion. Harper's Weekly, May, 1878. Guard Mount in the Courtyard, Fort Marion, by Ashmead Bros., Summer, 1876. Beinecke Library, Yale University. Capt. Pratt's hand-written caption, verso: "The change of a year." See image here. "Okahaton (Making Medicine), a Cheyenne, the first sergeant of the company, mounted the guard each morning and selected the cleanest and most soldierly Indian for my orderly. The orderly went with me during the day, and when I was in my office he was on call to show visitors about the fort and to go on errands to town, to my house, or to the commanding officer or adjutant at the lower end of town. He did not have to stand guard, so there was incentive to become orderly. One morning as the guard was being mounted, I noted that there was considerable delay, and Okahaton came to the office and said, "Captain, two just same. Me no understand which cleanest." So I went out and looked them over, and sure enough I was also perplexed to know whether the Cheyenne or the Kiowa was the cleanest. Their clothing was brushed as clean as possible, their brass buttons were as bright as they could be, and their shoes equally well polished. As I passed front and rear, they stood equally erect in the position of a soldier. The whole body of Indians was out observing and I concluded that there was a contest as to which tribe would secure the orderly for the day. I kept looking them over, even their ears, to see if they were clean, and their hair to see if it was nicely brushed, and noted that their shirts and stockings were clean. Finally, I saw that the fingernails of one of the candidates were long and unclean, and looking at those of the other who stood beside him found them clean. The first sergeant was watching carefully. I took hold of a hand of each and held them side by side so he could see the contrast. He at once made the Indian sign with his forefinger extended, raised his hand and brought it down quickly, which meant 'I understand.' When the decision was made there was applause from part of the Indian audience. Thereafter, the finger nails did not escape Sergeant Okahaton's attention, and even the older men were found cleaning their nails when getting ready for inspection or to go down town" (Pratt, 1964: 187). Although the pair are dressed for hunting, this must have been an unlooked for opportunity. Etahdleuh and a friend have come upon this small herd so unexpectedly, there was no time to quietly dismount and string their bows. Instead, the prey have bolted, and the young hunters have drawn pistols as they race after. Both horses are haltered with coveted, nickel-silver trade bridles, that came into wide vogue among the Southern Plains tribes after 1866, and were often stamped or rocker-engraved with intricate designs (see Cowdrey, Martin & Martin, 2012: 55-56 & 106). Fine, Kiowa bridles of this type are illustrated here (blue background): See image here. A Kiowa Boy, son of Head Chief Wooden Lance (Ah-peah-tone), riding with a Silver Trade Bridle. Photo by James Mooney, near Anadarko, Oklahoma Territory, 1893. In Kiowa relationship terms, this boy, son of Etahdleuh's brother-in-law, would have been called "nephew" by the artist. National Museum of Natural History, Neg. No. gn_01393. See image here. Kiowa Sketchbook: Plate 4, Davis Museum, Wellesley College, Massachusetts. "Hunting Turkeys and Deer," by Koba (Wild Horse). See image here. Young Kiowa man wearing the type of hat depicted by Etahdleuh. Photo by Will Soule, Fort Sill, I.T., ca, 1868-69. Kansas Historical Society, Neg. No. 227871. These were popular trade items sold in the Sutler's Store at Fort Sill. Pp. 7-8 Accidental Meeting of Kiowa and Osage War parties. The footprints tell the story. A Kiowa war party is approaching on foot from the right, on Page 8. The leader is designated by his badge of office, a sacred pipe, with which he must pray for the success of his men. Four scouts have been sent ahead to reconnoiter from the top of a butte. There, they have espied another approaching war party. Two of the scouts have remained on the butte, to signal and warn their fellows of possible danger. The other two, senior scouts have bravely climbed down the far side of the butte, and surreptitiously (winding footprints) have moved forward to the low, green hill in the middle of Page 7. There, after peeking over and ascertaining that the approaching party were not enemies, but some of their Osage allies, the two scouts are walking boldly out to greet the leaders, and apprise them of their own, nearby party. Both of these scouts are senior warriors wearing circular Peace Medals of the type presented to Indian leaders negotiating with U.S. government officials. It is likely this is an adventure of Etahdleuh's father. Recall the evidence, above, that his father may have been Wolf Lying Down, the Kiowa 2nd Chief, who was a member of the 1872 delegation , and was photographed in Washington, D.C., wearing the peace medal then presented to him. Another leading Kiowa war chief, White (Grizzly) Bear, (Set' tainte), called "Satanta," received a similar medal, probably during the Medicine Lodge Treaty negotiations in 1867. White (Grizzly) Bear, (Set'tainte), Kiowa Chief, wearing Peace Medal. Photo by Will Soule, at Camp Supply, I.T., 1867. See image here. The purpose of this drawing, documenting an event that must have been well known among the tribe, appears to have been to honor and laud the courage of Etahdleuh's father. The Osage war party, lined up at far left on Page 7, are recognizable from their very different hairstyle, the scalp entirely plucked, save for a medial crest of hair. They are armed with tomahawks, swords and lances. Some of the Osage warriors depicted in the earliest tribal photographs, made in the autumn of 1865, may have been in this war party depicted by Etahdleuh. Osage warrior with painted face. Photo by Burrell Z. Gannaway, at Fort Smith, Arkansas, Sept. 1865. Wilson's Creek National Battlefield, Neg. #WICR 31894. See image here. Osage men photographed by Burrell Z. Gannaway, at Fort Smith, Arkansas, Sept. 1865. 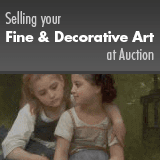 Heritage Auctions, Dallas, TX. See image here. Etahdleuh and a friend have crawled within rifle shot of a small herd of ten buffalo. They are on a low elevation, shooting downward. Perspective is suggested by the smaller size of the animals. Note that all are cows, often preferred for their more-tender meat. The pair of sticks each man has stuck in his belt might have been crossed in the left hand, and used as rifle rests, if necessary. Compare the drawing on Page 11. Here, the hunters have succeeded in getting so close to their quarry, the extra supports are not needed. P. 10 War Partners Parading in Camp. "The institution of [warrior] society partners, known as com (friend) and cha (the address form for 'friend' and 'partner'), and the pairing of two men as adoptive brothers permeated society membership. This adoption entailed extensive and reciprocal kinship and economic aid. Members of a society were also considered collectively to be brothers, and a loose network of social services and aid existed among them" (Meadows, 2010: 6). It is certain that this is a self-portrait by Etahdleuh, who shows himself at the left. Both men are dressed in their best clothing, hoping to impress any eligible girls. Kiowa war partners parading together on the same horse. Photo attributed to H.P. Robinson, Fort Sill, Indian Territory, ca. 1887. Huntington Library, Pasadena, CA. Note especially the eagle-tail fans carried by the men on these occasions, which are a code-image signifying "courting scene." Etahdleuh's special partner may have been the older warrior Koba (Wild Horse), who stayed together in the East with Etahdleuh through their year and a half at Hampton Institute, then at Carlisle Indian School for another year, until he contracted tuberculosis and died shortly after returning to Indian Territory in 1880 (see Cowdrey, 2008). Koba (Wild Horse), at Fort Marion, 1878. National Museum of American History: See image here. In a group drawing with 19 figures done at Fort Marion, Koba named only himself and Etahdleuh together: "My friend Burnet, I gave this the picture," by Koba. National Museum of Natural History, MS 39C: See image here. A very similar courting scene drawn by Koba, also in 1876, assures that the two friends were admiring, comparing and probably laughing about these depictions of their shared experiences. Koba-Russell Sketchbook, 1876, Plate 24, "We have come to see our sweethearts": See image here. Etahdleuh drawing, 1880. National Museum of Natural History, Cat. No 08517800: See image here. Note in all of these drawings the repetition of a typical design of beaded strip worn on Kiowa courting blankets, documented also in this photograph of a young Kiowa man, by Will Soule at Camp Supply, Indian Territory, ca. 1867: National Museum of Natural History, Neg. No. 01622402: See image here. Compare the clothing of the left figure here on Page 10, especially the yellow-painted leggings with beaded strips in a design of bear tracks, and what is carefully intended as the same roan overo-paint horse, both shown on Page 17. There, the Kiowa rider is a senior warrior reviewing the men of a war party. Etahdleuh was too young by 1875, when he was arrested, ever to have fulfilled such a role. But here, there would also be no purpose in glorifying some other Kiowa showing off for the girls. The solution to this apparent conundrum may be that the senior warrior on Page 17, who also appears as a prominent chief wearing the same leggings on Page 19, may have been the unknown father of Etahdleuh, possibly Wolf Lying Down, as explained above. Etahdleuh has borrowed some of his father's flashiest clothing, and his father's best war horse, just as a modern-day teenager might borrow dad's car to impress his best girlfriend. P. 11 Still-hunting White-Tail Deer. Etahdleuh and two friends have succeeded in getting close enough to ambush a small harem of white-tail deer. This was not an easy feat, as any modern hunter might appreciate. The partner at upper right has drawn first blood, dropping a doe. Etahdleuh, lying prone in the foreground, has just shot the buck in the chest. Blood is just beginning to spurt from the fatal wound. Pp. 12-13 Running Buffalo on Rainy Mountain Creek. Many of Etahdleuh's drawings are remarkable for the inclusion of topographical details---streams, hills, mountains and buttes---which suggest that he was trying to indicate the exact place where the event occurred. Probably many of his contemporaries would have been able to recognize these locales. For us, nearly 150 years later, the scenes on Pages 18, 23, and 32-33 are too generic to be localized. Here, however, with large Kiowa camps represented near the intersections of three, important streams, we may recognize the artist's intention. In the 1890s, a Kiowa elder named Black Goose created a very detailed map on muslin cloth of traditional Kiowa territory. Now in the National Museum of Natural History, Cat. No. 233,091, the Black Goose Map, with added numbers specifying the locales, has been reproduced on page 267 of this document (Meadows, 2006): See image here. See also the detailed discussion in Meadows, 2008: 192-199. In only one area do three streams converge in the pattern depicted by Etahdleuh. This is located near the top, center, of the Black Goose Map. The large stream flowing across the top of the map (No. 80), and also across the top of Etahdleuh's Pages 12-13, is the Washita River, called by the Kiowa "Tipi Pole River." The stream flowing diagonally across the center of Page 13, and joining the Washita at top, center, of Page 12, is Rainy Mountain Creek (No. 23 on the Black Goose Map). The smaller stream at the bottom of Page 12, joining Rainy Mountain Creek near its junction with the Washita, is Little Rainy Mountain Creek, known to the Kiowa as "Prairie Dog Creek" (No. 24 on the Black Goose Map). This area, filled with rich resources of timber, water, abundant grass for the Kiowa horse herds, and frequently visited by buffalo herds with similar needs, was a favorite camping location. "Bands along...Rainy Mountain Creek are still reflected by concentrations of allotments in these areas...Two camps near the mouth of Rainy Mountain Creek (23) represent Kiowa bands in that area, one of which was probably Big Tree's" (Meadows, 2006: 274). "Kiowa Camp." Photo by Will Soule, 1867. Wichita State University Libraries Special Collections: See image here. The same, exact locale now comprises Kiowa County, Oklahoma, the heart of the Kiowa Reservation. Compare this 1913 topographical map: See image here. In this wonderful landscape, with hunters running bands of buffalo along both Rainy Mountain Creek, and along the north side of the Washita River, Etahdleuh has depicted the very center of the homeland from which he had been torn, the previous year. Pp.14-15 Fort Sill, Indian Territory, and Environs. Another favorite Kiowa camping area, south from Rainy Mountain Creek, was the Wichita Mountains; and a favorite vision-questing locale called Medicine Bluff. A landform unique on the Southern Plains, sheared exactly in half by ancient geological forces, the stream which flows past the bluff is called Medicine Creek. The site of Fort Sill. "The Wichita Mountains from the Medicine Bluffs, In. Ter." by Hermann Stieffel, 1867. Smithsonian American Art Museum, Cat. #1985.66.384,188. Compare this early view, with Etahdleuh's memory on Page 15, upper right: Medicine Bluff at the left, nearest Fort Sill, then a small, intervening peak, with Mount Sheridan and the Wichita Mountains beyond. See image here. Nearby in 1867, the U.S. Army built a post and named it Fort Sill, Indian Territory. It soon became the location of the Agency for the Kiowa and Comanche tribes, where their leaders were forced to interact with a succession of army and government officials. Fort Sill buildings under construction. Photo by William S. Soule, 1868. National Archives. See image here. Fort Sill is where the defeated and starving tribes were forced to march, all the way from the Texas Panhandle after the Battle of Palo Duro Canyon in September, 1874. It was also the site where Etahdleuh and the other Fort Marion prisoners had been arrested in early 1875, then deported from everything they had ever known. Etahdleuh's memory of the place, the quadrangle of buildings with a large flag flying at center, compares very well with an engraving done in about the same year, but from the opposite direction, showing the post nestled in a bend of Medicine Creek. Fort Sill, Indian Territory, ca. 1875. Library of Congress. See image here. At upper right on Page 15, the first landform above Fort Sill is Medicine Bluff; and next beyond is the peak the Army named Mount Sheridan. In 1875, the Army had observation posts atop each. Etahdleuh's drawing may be the only record of these transient structures. Medicine Bluff, Wichita Mountains, near Lawton, Oklahoma, and the site of Fort Sill. See image here. Three different Kiowa and/or Comanche villages are shown near the Army post. One is pitched along the smaller stream entering Medicine Creek at the right, on Page 15. Kiowa Village of Lone Bear, near Fort Sill, by Will Soule, ca.1872. National Museum of Natural History, Neg. No. 01157800. See image here. Another, larger camp, probably that of White Bear (Set'tainte), and a third, smaller camp are located nearby, further along Medicine Creek. Set'tainte was a member of the Elk (Ko-gui) band of the Kiowa (Mooney, 1898: 228) Note the black-painted tipi with a design of white circles, at the left end of the larger village shown on Page 14. This is the Do-kinkza, or "Black Star Tipi," which belonged to a prominent family of the Ko-gui band. The left half of the cover was painted black, with an overall design of white circles (stars); while the right half was red, with white circles. "Black Star (Do-kinkza) Tipi." A painted model collected by James Mooney in 1904, with descriptive caption preceding, may be examined on the 4th page of photographs, at the National Anthropological Archives, here: See image here. Boarding School, Fort Sill. Photo by William P. Bliss, 1872. Oklahoma Historical Society, Josiah Butler Collection, Neg. No. 2027: See image here. At the lower curve of Medicine Creek, at left on Page 14, is shown the Sutler's trade store, where non-essential items like glass beads, fancy wool cloth blankets, straw hats, curved rooster tail feathers for male Onde members to wear, and sheet nickel-silver were in supply, at high prices. The Sutler's Store,with members of Setangya's band in front. 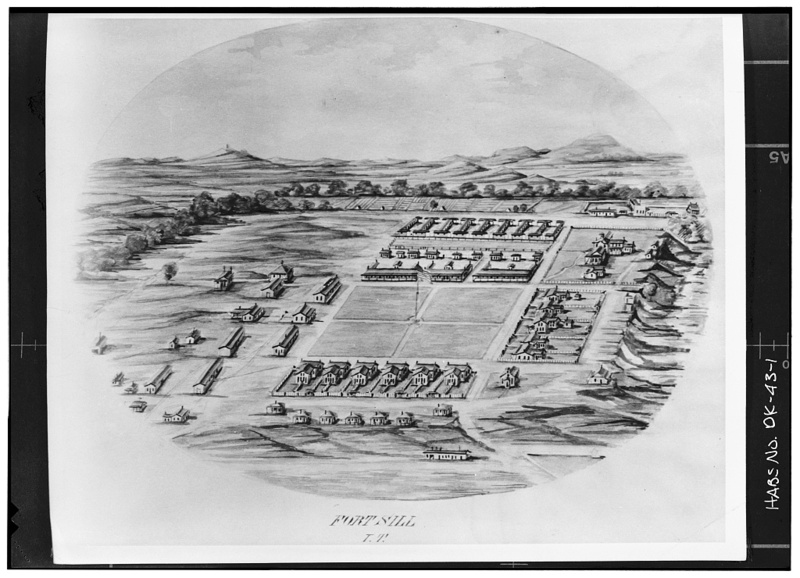 Photo made at Fort Sill by William P. Bliss in 1872. Oklahoma Historical Society, Josiah Butler Collection, Neg. No. 191: See image here. In this important photograph, the man standing 2nd from right is MIS-identified by Oklahoma Historical Society as "Set'tainte (White Bear)." Instead, he is Sitting Bear (Setangya), called "Satank," (compare the facial portrait shown with Pages 27-28), and here, he is wearing across his chest what is undoubtedly the yaipo-konkya, or "Black Rope" of the Ka'itsenko Warrior Society, the most-famous war implement in Kiowa culture. Etahdleuh has also depicted it, on Page 27. Some of the few women shown by Etahdleuh appear in this composition. Four are shown at lower left on Page 14, walking from the large village toward the nearby trade store. Two others, shown in back view, stand near the fort buildings on Page 15. Pp. 16-17 Inspection of a Departing War Party. Frizzle Head (Adalpepti), dressed and armed as he went to war in the 1860s & 1870s. Photo by James Mooney, near Anadarko, Oklahoma Territory, 1891. National Museum of Natural History, Neg. No. 00637000-000001.See image here. Note especially the long string of round, nickel-silver "hairplates" attached to his scalplock, and hanging nearly to the ground. Twelve of the sixteen other members in the drawings wear similar, very-expensive expressions of social status. Adalpepti carries a shield, bow and arrows, and a short war lance. His horse is harnessed with a trade-bridle trimmed with nickel-silver, of the type Etahdleuh depicted on Pages 5, 10, 17, 19, 22, 26 & 29. The rear-view depiction of these sixteen warriors is a very remarkable departure by Etahdleuh, from the traditional, right-to-left profile depictions in most Plains Indian art, and which he, himself, usually adopted. Other rear-view figures appear on Pages 3, 4, 15, 18, 19, 22, 23, 24, 25, 28 & 31. Full-frontal figures appear on Pages 3, 22, 28, 29(red horse) & 31. Frontal views of horses' heads, with their bodies in profile, are on Pages 22 & 29. All of these are indications of imaginative innovation. All of the artists at Fort Marion were working in tandem, and picking up ideas from one another. The narrative reason that Etahdleuh chose the rear view in this composition is that it allowed him to show details of the hair decorations and headdresses of each man, which were unique "signatures" comparable to name glyphs, that would have been recognized and understood by all of the Kiowa. This is not merely "a picture." It is a careful depiction of a specific occasion, with each of the participants shown as they were actually dressed. Four men in this party, wearing wide, red sashes diagonally across their backs, are Ka'itsenko Society warriors, the bravest men in the tribe (see the discussion with Page 22). Two others, standing beside the sash-wearers and wearing more-narrow, "honorary" sashes, are their junior war-partners (Mooney, 1898: 284). Two others, each with a curved feather worn in his otter-fur turban, are members of the elite, Onde social class. "The Cow-shield of White Horse, Kiowa, with Headdress, Bridle Pendant & Pouch." Collected by James Mooney, at Fort Sill, Oklahoma Territory,1891. National Museum of Natural History. P. 18 Running Buffalo on Horseback. In the foreground, three wounded buffalo lag behind the herd. One of these cows, with an arrow into her lungs and consequently coughing blood, has turned to charge her killer, as his well-trained buffalo runner dances away. P. 19 Meeting of Kiowa and Osage Chiefs. As discussed above, this distinguished Kiowa War Chief at the left, the same man shown on Page 17 as leader of a war party, and wearing the same yellow-painted leather leggings with beaded strips in a design of bear tracks on both occasions as Etahdleuh shows himself wearing on Page 10, is most likely the artist's own father, probably Wolf Lying Down. Here, he rides an overo pinto charger, the white patches of its coat accented with yellow paint, and large, brown spots. The horse's tail is wrapped with red wool cloth and accented with an eagle feather, a preparation for battle. Although armed with a shield and war lance, apparently this encounter was an unexpected surprise, as in the accidental meeting on Pages 7-8, for the Kiowa has swept the spectacular eagle feather headdress from his head, signaling to the approaching rider that his intentions are peaceful. Kiowa Eagle-feather headdress, 19th Century. University of Pennsylvania Museum, Cat. No. 38056 AT. See image here. The man at the right, an Osage war chief, has understood the gesture, and reaches out his right hand to grasp the left hand of his Kiowa ally. It is even possible that this is a second, accidental encounter of the same, two leaders shown on Page 7. Again, the Osage leader is wearing a Peace Medal. The Kiowa, instead, wears a red sash diagonally across his chest, probably an insignia of the Ka'itsenko Warrior Society (see the discussion with Page 20). The Osage rides a brown overo pinto, its tail also bound. He is armed with a pipe-tomahawk; also has beaded leggings, and wears a red wool war shirt probably decorated with strips of intricate silk ribbonwork, and the sleeves trimmed with locks of black human hair, alternating with panels of yellow-dyed horse mane. Although wearing a roach-style headdress with one eagle feather accent, he is also trailing an unfolded headdress of eagle feathers, which he might have donned, had the encounter not proved fortuitous. Black Dog, Osage War Chief. Photo by Burrell Z. Gannaway, at Fort Smith, Arkansas, Sept. 1865. British Museum, Neg. No. Am.A38.84. His hair is dressed exactly like the Osage portrayed by Etahdleuh; he also wears a choker necklace of woven seedbeads, like the Osage in the drawing; and his fringed war shirt is trimmed with strips of cut and folded, silk-ribbon embroidery, a tribal specialty. Pp. 20-21 Battle with the Sauk & Fox, 1854.This famous encounter occurred about two years before Etahdleuh was born, so it is clear he was illustrating the Kiowa experience as it had been related to him by others who were there, almost certainly including his own father. "In the summer of 1854 the Kiowa, Comanche, [Kiowa-]Apache, Cheyenne and others of the Plains tribes organized a great expedition for the purpose of exterminating the immigrant tribes in eastern Kansas, whose presence was beginning to be felt in an ominous decrease of the buffalo. Although this was perhaps the largest war party ever raised by the Plains Indians south of the Sioux country, being estimated to number 1,500 warriors, they were ingloriously defeated with heavy loss by a party of Sauk and Fox numbering hardly a hundred, the result being due to the fact that the latter were armed with long-range rifles, while their enemies had [mostly] bows and arrows" (Mooney, 1898: 174-75). About the year 1897, George Bent talked with an old Sac who had been with the party of hunters. The man said that when they saw the great force of prairie Indians coming toward them...the Sac chief ordered his men to retreat to a ridge nearby, and this move...saved them from annihilation. They were hardly in position when the mounted men charged them from every direction. The Sac and Fox were all armed with good guns, and fought on foot, but---except the Osages---the prairie Indians had few firearms. The attacking party charged again and again, but were unable to get near enough to their enemies to use effectively either their bows or their old smooth-bore trade guns. The Sac and Fox...having some idea of discipline and order, so handled their rifles that all the guns were never empty at the same time...they fired by relays, and thus were able always to repel the charges made on them...The Sacs lost five men killed and four wounded, and this loss was inflicted by the Osages, who had good guns" (Grinnell, 1915: 97-99). "The Blackfeet [Black Leggings] had a hooked stick called pobu'n, belonging to one officer. It was wrapped with beaver [otter] skin, painted with different colors, and tied with pairs of eagle feathers along the shaft and at the tip of the crooked part...The people knew that a man accepting the pobu'n had to be a brave man. When in battle, he would plant his stick in the ground and thereafter would not flee unless it was taken out by someone else" (Lowie, 1916: 847). Kiowa Pobu'n of the Black Leggings Warrior Society, collected by James Mooney, at Anadarko, Oklahoma Territory, 1892. National Museum of Natural History, Neg. No. gn_01457. See image here. It is likely this figure represents a relative important to Etahdleuh; and the purpose of the whole composition is to document his participation in this storied battle, which accrued to the glory of his family. As the evidence elsewhere (see Page 22) is that Etahdleuh's father was a leader of the Ka'itsenko Warrior Society, this brave Pobu'n owner may have been an uncle. P. 22 Initiation of the Ka'itsenko Warrior Society. In ethnographic terms, this rare depiction is probably Etahdleuh's most important drawing, corroborating the two historical descriptions of this society, but also adding much new, visual information. Only one similar drawing, by Etahdleuh's partner Koba, is known. "Q'o i'tse'nko---Real Dogs, but actually [meaning] 'Horse Owners' [accomplished warriors and rustlers]. 2 leaders, ten members, in age from about 25 upward. The distinctive badge of membership was a sash...about six inches wide and long enough to drag along the ground; it was made of rawhide, buckskin or red cloth. In a war it was a member's duty to sing the song of his society, fasten his sash to the earth with a spear and thereafter to stand his ground regardless of consequences; anyone who fled lost his prestige and membership, unless he had been released by some other man. The ceremonial paint of this organization was red, which was used all over the face and clothes, including the moccasins, and also on their feathers....members of this organization were expected to be especially brave; accordingly, they enjoyed greater prestige than other societies. In age, they range from about 25 upward" (Lowie, 1916: 847-49). Ka'itsenko Initiation of 1846---"Hornless-bull initiated", from Mooney, 1898: Fig. 95: See image here. Of the ten opam-yaipo [sashes], the principal one, called the yaipo-konkya, 'black rope,' was made of elk-skin colored black and was worn by the leader, the most noted of whom in recent memory was Set-angya. [Compare Page 27, far left]. Three were made of red cloth and were called yaipo-guadal, 'red ropes,' while the remaining six were made of elk-skin dyed red and were called simply opam-yaipo"
Any of the Ka'itsenko was at liberty, if he did not choose to go on a particular expedition, to lend his sash for the occasion; but if cowardice was suspected to be his motive...he was degraded from his rank and the sash taken from him and given to a braver man. Usually each one had a younger partner (tsa), whom he allowed to wear his sash while in camp [to impress available girls, while courting], or even on less important expeditions, but when any great party was on foot, he must wear it and go himself, or run the risk of being considered a coward" (Mooney, 1898: 284-85). Six of the opam-yaipo are depicted by Etahdleuh in this drawing. Two of the senior Ka'itsenko warriors, on horses sporting silver bridles, are wearing the yaipo-guadal, 'red ropes' made of red wool cloth. Two others in the upper row, and two seen from the rear at lower right, must be wearing the similar opam-yaipo made of elkskin painted red. The black yaipo-konkya of Sitting Bear is shown "in action" on Page 27, far left. Etahdleuh's father, who has elsewhere been depicted as a leading warrior, is likely the main figure here, the rider at upper right brandishing a cavalry saber. A brass bell is tied under the throat of his white horse. All of the members seen from the rear wear expensive strings of nickel-silver hair-plates hanging from their scalplocks. Three men wear the curved head-feathers reserved for the Onde. The man at upper left wears the stuffed skin of a red-headed woodpecker. As Lowie's informants reported, all of the men in the top row are either painted red on the upper body, or are wearing red shirts. However, those in the lower rank display either yellow or green. It is likely the six wearing very narrow sashes are the "younger partners" described to Mooney. These straps may be in the nature of "honorary opam-yaipo," of the type the partners were "allowed to wear while in camp." Note that these same, six "partners" each has a unique type of feathered headdress, with eagle tails hanging at the back. No living member of the Kiowa tribe, nor anyone else interested, has ever seen these critical details before. These are among the greatest gifts that Etahdleuh sent into the future. "A Medicine Dance." Koba-Russell Ledger, 1876, Plate 21. Mandeville Library Special Collections, UC, San Diego (La Jolla). See image here. Elk Tongue (Mobiel), Kiowa war chief, and later Army Scout. Photo by H.P. Robinson, Fort Sill, Oklahoma Territory, 1891. Library of Congress, Prints & Photographs Division, Neg. No. LC-USZ62-126697. Note that he is wearing an eagle-feather headdress with attached buffalo horns, of the type depicted at upper right on Page 22, and is carrying a war shield. The lion-fur strap across his chest is not a Ka'itsenko sash, but the strap supporting his quiver-bowcase. See image here. Five young, Kiowa men are shown carefully creeping up on buffalo scattered among the hills along a stream. Three are wearing straw hats that probably came from the Sutler's trade store at Fort Sill. P. 24 Council Meeting or Feast of the Ka'itsenko Warrior Society. The sash-wearing official at the right of the large, council tipi, tells us that this is another event of the Ka'itsenko Society. This man has just raised another society emblem on a high pole, in the nature of a printed sign that might say "Kiwanis Club Meeting Here Tonight." This ensign is a carved, wooden quirt, or horse whip, its two lashes hanging from the serrate, yellow-painted wooden handle. This is decorated with silver studs. The red-painted wrist strap appears to be decorated with silver conchos, of the small size seen on women's belt-drops. In a hand-to-hand fight, this might also become a "club." Note the red-dyed feathers in his hair, and compare with Fig. 95 from James Mooney's 1898 report, attached above with Page 22. Kiowa serrate-handle horse whip, late 19th century. Peabody Museum, Harvard University, Cat. No. 99-12-10/53038. See image here. Another official on the left side of the tipi has raised another society emblem, a large otterskin war cape decorated with silver conchos, or perhaps circular trade mirrors, and red silk ribbons. Compare a similar cape being worn to war on Page 26. Members, none wearing his Opam-yaipo (sash), file into the meeting. The gathering may have been more in the nature of a feast. This would have occurred during the week of the Medicine Lodge ceremony, in late-June or July. Young women standing around to watch the arrivals carry parasols against the hot sun. These were a popular trade item by the 1860s. P. 25 Pot-shooting Golden Eagles. A family of golden eagles, two adults and three young birds not yet fledged, have been found nesting in a tree by four Kiowa friends, who are in the process of killing them all to use the feathers in making headdresses, or trimming shields, lances and other war regalia. Note the clear intention, familiar to us after more than a century of commercial cartoon illustrations, to illustrate the sound of the scream made by the adult eagle, as it has been shot in the chest. Etahdleuh, and other Plains Indian artists, anticipated that idea by more than a quarter century. Tissue Separator Signature of the Artist on a Tissue Sheet between pages 25 & 26. Note that at this early date the phonetic transcription of his Kiowa name had not yet become set. He was learning to use English characters to express Kiowa phonemes. In this initial version, he wrote: "Etahdlauh." Capt. Pratt testified that as quartermaster sergeant at Fort Marion, the 20-year-old Etahdleuh was already keeping a daily inventory of all supplies for the entire prison (Pratt, 1964: 185). It is clear that the young man was a very quick study. Everyone who ever knew him said the same. P. 26 Advance Scouts of a Kiowa War Party. The center rider wears a horned headdress of dark (mature) golden eagle tail feathers, perhaps also dyed red, of the type in this portrait of the famous Kiowa artist, Silver Horns. Silver Horns (Hawgone), Kiowa, oil portrait by Elbridge Ayer Burbank, 1898: See image here. Silver Horns' older brother High Forehead (Oheltoint), later called "Charley Buffalo," had been another Fort Marion prisoner, and one of the close friends and war-partners of Etahdleuh---they are often sitting close together in photos at Fort Marion, and later at Hampton Institute. It is possible, therefore, that the headdress worn in the portrait by E.A. Burbank is the actual one depicted from memory by Etahdleuh, and later borrowed by Silver Horns after his brother returned home. This figure on the green horse is also wearing an otter fur cape decorated with silver conchos, very similar to another depicted in the Ka'itsenko society ceremony on Page 24. Pp. 27-28 A Scout Reporting to the Leader of a War Party. The scout, at far right on page 28, pointing perhaps to alert the party to the presence of enemies, wears a turban of spotted fur, either of bobcat or juvenile mountain lion. He is addressing the leader, who is signalized as a member of the elite Onde class, by a curved feather stuck into the band of his straw hat. The scout's news appears to have galvanized the party, who are mounting up for action. See the discussion on Pages 29-30, for the likelihood that this young scout with the spotted turban may be Etahdleuh. Tapedeya, Kiowa warrior, wearing turban made of bobcat or mountain lion fur. The early film emulsions may not always have registered tonal details, such as spots on fur. Photo by Will Soule, at Camp Supply, Indian Territory, ca. 1867. National Museum of Natural History, Neg. No. 01161701: See image here. The man at far left on Page 27, considered the bravest man in the Kiowa tribe, is Sitting Bear (Set-angya), wearing the unique "black rope," or sash, of the Ka'itsenko Warrior Society: "Of the ten opam-yaipo [sashes], the principal one, called the yaipo-konkya, 'black rope,' was made of elk-skin colored black and was worn by the leader, the most noted of whom in recent memory was Set-angya" (Mooney, 1898: 284). Sitting Bear (Setangya), called "Satank," by Will Soule, at Camp Supply, Indian Territory, ca. 1867. National Museum of Natural History, Neg. No. 01158500: See image here. Here, Etahdleuh adds the very important details that the elkskin "black sash" also was accented with yellow paint on one side, together with golden eagle feathers and silver conchos. For the only photo of the "black rope," see the discussion of the Fort Sill Post Sutler's Store, with Page 14, above. "Warrior pursued by Mexican Soldiers." Etahdleuh Ledger, Plate 28, ca. 1877. Rice County Historical Society, Faribault, Minnesota: See image here. White Horse (Tsen-t'ainte), Kiowa War Chief, on horseback with shield, photo by James Mooney, near Anadarko, Oklahoma Territory, 1893. National Anthropological Archives, Neg. #gn_01377. See image here. Feathered Lance (Gaapiatan), Kiowa, with war shield painted much like the two on Page 28; and another on Page 29. Photo by James Mooney, near Anadarko, Oklahoma Territory, 1892. National Museum of Natural History, Neg. No. gn_01419. See image here. Pp. 29-30 A Ka'itsenko Warrior Society Sash Wearer Reporting to the Leader of His War Party. It is probable that this brave Ka'itsenko warrior is the same leader of that society depicted earlier, on Pages 17, 18 & 22. See those discussions for the likelihood that this protagonist represents the father of Etahdleuh. Robert Lowie's informants indicated that Ka'itsenko members were referred to "with some additional honorific epithet, possibly connected with the office of scout" (Lowie, 1916: 8848). Note the spotted feline-fur turban worn by the scout on Page 29; then compare the spotted turban of the younger man riding at far right on Page 30, his yellow shield, and dark, otter fur quiver, with all of the identical accouterments of the scout shown on Page 28. It is likely the younger man in both drawings represents Etahdleuh. On Pages 29-30, he is shown in an "apprentice" relationship with his father; while on Pages 27-28, he is on his own, now following in his father's honored career. Solitary Traveler & Family, Kiowa. Photo by James Mooney, near Anadarko, Oklahoma Territory, 1892. National Museum of Natural History, Neg. No. gn_01418a. A son of the noted war chief Big Bow, Solitary Traveler wears a horned headdress, and carries a typical battle lance. Note the decorative cloth panel attached to the shaft. See image here. A Kiowa war shield similar to those depicted, Heritage Auctions, Dallas, TX, 2006: See image here. Kiowa war shield, ca. 1860s, Peabody Museum, Harvard University, Cat. No. 95-30-10/62469: See image here. P. 31 An Osage War Chief Visiting the Kiowa. Delegation of Osage Chiefs at Lawrence, Kansas, 1874. Kansas Historical Society, Neg. No. 305401. See image here. It is possible one of these leaders was the Osage visitor recalled by Etahdleuh, at nearly the same date. 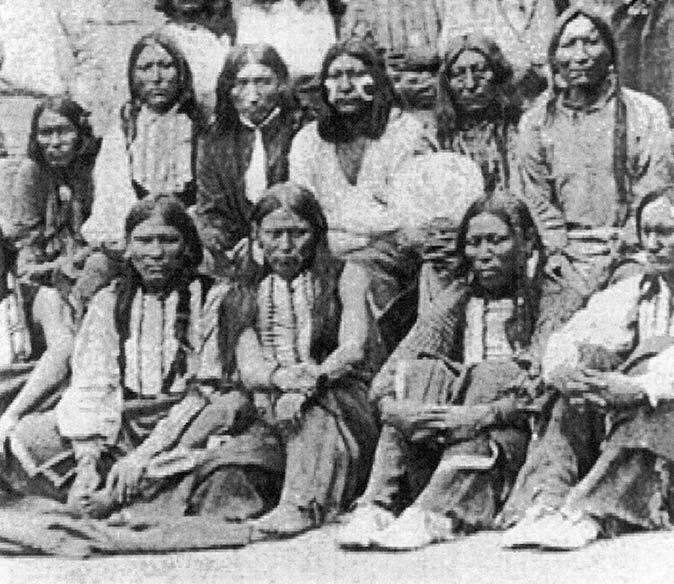 The guest is shown at center, right, his plucked hairstyle in stark contrast to the carefully combed, long hair of all the Kiowa. He and the Kiowa leader, both dressed in Army officers' coats with gilt epaulets, are in the act of exchanging gift swords. The Osage holds the Kiowa-style sword, with split-otterskin wrist guard, just given to him; as the Kiowa chief receives the Osage blade, with a pendant cloth drop, filled out with eagle tail feathers. Compare this with the two Osage-style swords shown on Page 7. It is likely, again, that the artist's purpose in this drawing was to memorialize a prominent occasion in the life of his father. Now compare the Osage gift sword shown here, with the sword carried by the Ka'itsenko chief on Page 22. It might very well be the same weapon, the valued gift of an ally. All three of the Kiowa warriors at the left wear "red ropes" of the Ka'itsenko Society. Both the military coats, and the light-cavalry sabers, were probably obtained as army-surplus. At the end of the Civil War, whole warehouses filled with uniforms and military equipment that was no longer needed, were bought for low bids by western contractors, then traded at profit to tribes on the Plains. Frizzle Head, (Adalpepti), Kiowa, wearing the army-surplus coat of an officer, with epaulets, and holding a light-cavalry saber. Photo by William P. Bliss, at Fort Sill, Indian Territory, 1875. Kansas Historical Society. Note that the painted backdrop is a depiction of the famous Medicine Bluff, nearby. See image here. Each of the two Kiowa men at the right wears a bandolier made of red mescal beans drilled and strung on cord. These were a popular decoration among members of the then-new Gourd Dance Society, a social support organization with many popular songs, that has endured to the present day. Gourd Dance Society bandolier of strung Mescal Beans. Contemporary. See image here. A party of Kiowa buffalo hunters, concealed behind a low range of hills, sees the signal of their scout that the quarry has been found. "[He] waved his robe...the usual signal that buffalo had been sighted" (Curtis, 1908: 114). It is very likely the purpose of this drawing was to show that the artist had accomplished this goal, in helping to feed his people; that is, Etahdleuh was the scout. The season is about June, when the new-born buffalo calves still retained their yellow-colored coats. Note that all of these hunters are armed only with bows and arrows, not firearms. What appears at first glance to be two "hills" in the background of Page 33, is actually intended as an overhead view of the blue, winding river beyond, framed along both banks by heavy timber. Battey, Thomas C., The Life and Adventures of a Quaker Among the Indians (Boston: Lee and Shepard, 1875). Cowdrey, Mike, "Kiowa Comrades, Far From Rainy Mountain: The Productive Exile of Koba (Wild Horse) and Etahdleuh Doanmoe (Hunting Boy), 1878-1880," in Heritage American Indian Art Auction, September 19, 2009, (Dallas: Heritage Auctions, 2008). Cowdrey, Mike and Ned Martin and Jody Martin, "Horses & Bridles of the American Indians" in Bridles of the Americas, Vol. 2. (Nicasio, CA: Hawk Hill Press, 2012). Curtis, Edward S., "The Teton Sioux; The Yanktonai; The Assiniboine" in The North American Indian, Vol. 3 (Cambridge: Harvard University Press, 1908). Ehrenfight, Phillip, A Kiowa's Odyssey: A Sketchbook from Fort Marion (Seattle: University of Washington Press, 2007). Lowie, Robert H., "Societies of the Kiowa" in American Museum of Natural History Anthropological Papers, Vol. XI, Pt. XI, (New York: AMNH, 1916). Meadows. William C., "Black Goose's Map of the Kiowa-Comanche-Apache Reservation in Oklahoma Territory," in Great Plains Quarterly 26 (4): 265-282, 2006. Kiowa Ethnogeography (Austin: University of Texas Press, 2008). Kiowa Military Societies: Ethnohistory and Ritual (Norman; University of Oklahoma Press, 2010). Mooney, James, "Calendar History of the Kiowa Indians," Bureau of American Ethnology, Annual Report, 1895-96 (Washington, D.C.: Government Printing Office, 1898). "Sleeping Wolf," in Frederick Webb Hodge, ed., Handbook of Indians North of Mexico, Vol.2, N-Z (Washington, DC: Government Printing Office, 1912) p. 601. Pratt, Richard Henry (Robert M. Utley, ed. ), Battlefield and Classroom: Four Decades with the American Indian (Lincoln: University of Nebraska Press, 1964). Ten Photographs accompany the lot, various sizes. All except No. 1 are ca. 1874-76. Photographers were not recorded. 1. Col. Richard Henry Pratt, ca. 1905, founder and Director of the Carlisle Indian Industrial School, Carlisle, Pennsylvania. 2. Anastasia Lighthouse, Saint Augustine, Florida. This huge, "barber pole" structure was "center view" from the upper walls of Fort Marion, and appears in many drawings by the Indian prisoners. 3. Balconies along Charlotte Street, Saint Augustine, Florida. 4. Sally Port, Fort Marion, with the original Spanish Coat-of-Arms above the portcullis; and view of Spanish cannon piled in the interior courtyard. These were moved by the Indian prisoners, to clear the courtyard for their activities. 5. Cypress (?) Swamp, near Saint Augustine. 6. "Draw Bridge, Fort Marion" (Title in negative.) Two prints. This entry to the fort appears in Etahdleuh's drawing "No. 1." 7. Tourists on the Terreplein (cannon deck), above the interior courtyard, Fort Marion; with distant view of Saint Augustine, showing that the prison is literally at the edge of the town. 8. Sea Wall and Saint Augustine. A panoramic view from the walls of Fort Marion, looking south. 9. "Group of Indians---Fort Marion" (Title in negative). Kiowa prisoners soon after arrival, ca. June 1875, posed in the interior courtyard. 1. Capt. Richard Henry Pratt, 10th U.S. Infantry, Commander at Fort Marion. 2. Lone Wolf (Gui-pago), Kiowa Head Chief. 3. Walks On the Sky (Mamante), who died soon after, on July 29th. 4. White Horse (Tsen-t'ainte) Head Warrior; a Ka'itsenko sash wearer, one of the ten bravest Kiowas. 6. Double Vision, or "Blurry" (So-gua-se). And from the State Library and Archives of Florida: See image here. Condition Report*: In overall good condition. Binding is very fragile; the dog-eared front cover is only connected through the lower half, the pages are secure, however. Pages with drawings are intact, no loss or tears. Water (?) damage to the top and inner edge of most pages. Otherwise small stains and light smudges scattered throughout the pages. Some tissue pages missing; the extant tissue pages are with small tears and creases. End page and back cover with loss. approx. 1" in length to bottom corner. No apparent restoration.